The root chakra is the first chakra of your physical body and is located at the base of your spine, near your coccyx bone (tailbone). Each of the chakra energy centers have a role in balancing your physical and emotional being. Your root chakra is connected to your sense of belonging, feeling grounded, and safety. 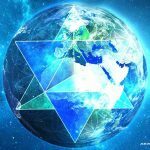 Your connection to your family, your ancestry, and planet earth all reside here in your body. From the relative strength of these connections, your personality begins to evolve. As the first of the seven major chakra of the physical body, it’s essential to pay attention to the root chakra in order for the others to function well. The keyword here is survival. All your survival instincts, resilience, and self-preservation characteristics live here. If you’ve recently had surgery, a major illness, or trauma like physical violence or betrayal or if you have a history that includes neglect, abandonment, or instability, your root chakra likely needs some support. Feeling spacey, distracted, or scattered are small signs that your root chakra may be out of balance. An out of balance root chakra can also manifest physically as bowel disorders (like constipation and/or diarrhea), chronic illness, anxiety, disordered eating, unexplained or random pain throughout the body, and lack of focus or motivation. Often, long-term feelings of vulnerability, paranoia, aggression, quick-tempered, insecurity, inability to relax, and anxiety are connected to an imbalance in this chakra. 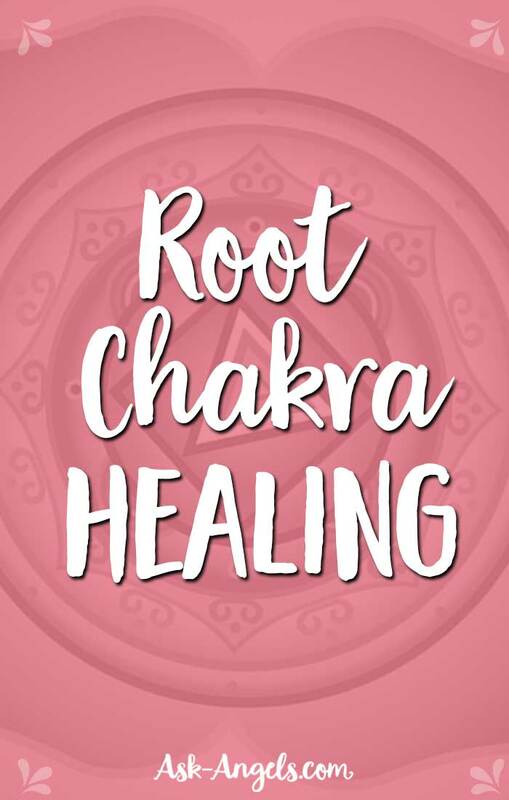 If you’ve always struggled to achieve your goals, or even lacked the confidence to set them, healing your root chakra can make a big change in your life. The root chakra is a major piece of the foundation for your overall health. When it’s in balance with no blockages you’re more likely to feel incredibly healthy, stable, relaxed, trusting, secure, and prosperous. You have an abundance of energy as well as abundance thinking in all areas of life. Feelings of centeredness, calmness, and preparation are all characteristic of a balanced root chakra. People tend to describe you as having a lot of common sense and you’ll feel easy with yourself – mentally and physically. 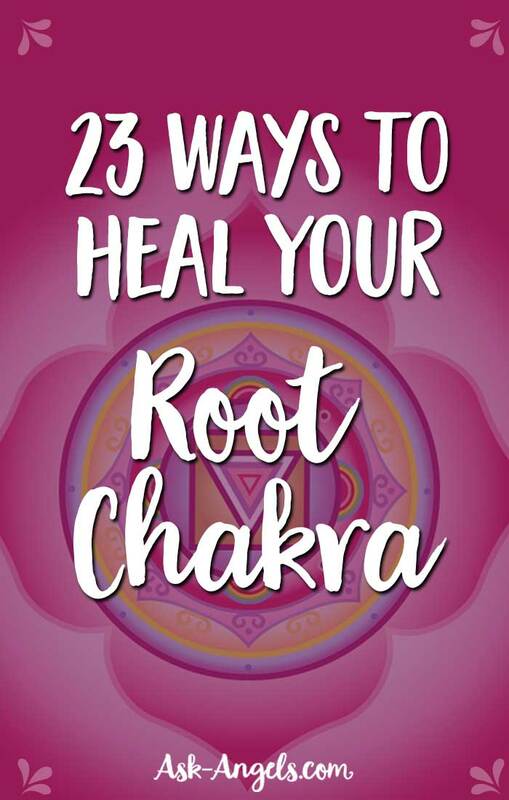 23 ways to bring root chakra healing into your life now. 1. Find some music you love and dance. Set your self-consciousness aside and let loose. Bonus points if you sing while you dance (a perfect way to heal your throat chakra). 2. Try earthy essential oils like patchouli, cedarwood, sandalwood, thieves, grounding, and frankincense to heal and balance your root chakra. 3. Visualize the color red at the base of your spine. After a few minutes, imagine the red light expanding down your legs, to your feet, and grounding you to Mother Earth. 4. Organize your work life or your home life. Create a filing system if you need to, put up some extra shelves, clean out a junk drawer. Anything to give you some structure. 5. Plant a garden or do regular yardwork. 6. Try the yoga pose legs up the wall. Or any other grounding yoga pose like mountain, elephant, downward dog, warrior I and II, and standing wide-leg forward bend. 7. Take a warm shower while practicing mindfulness. You can also try the waterfall of light technique in the shower. 8. Get out in nature and take a walk. Focus on feeling the energy coming to you from Mother Earth. For bonus points, walk barefoot to really ground your energy. 10. Enjoy a pedicure. When you put the focus on your feet and give them love and attention, the action helps to ground you and restore balance to your root chakra. 11.Eat mindfully and eat healthy comfort foods like root vegetables. 12.Make efforts to get involved in your community. Join an organization or simply meet your neighbors. 13. Try a grounding visualization where you mentally connect your body to the earth or earth’s core. 14. Move your body. Physical exercise supports root chakra healing – especial movement that focuses on your lower body. Identify an area of your life where you lack self-confidence and come up with a few simple steps you can take to overcome that lack. 15. Place healing stones around your home or work space. Choose red stones like garnet, red carnelian, bloodstone, red jasper, or others like smoky quartz, hematite, or jet. 16. Journal about the limiting beliefs you have about yourself as well as where those beliefs come from and how you can begin to change them. 17. Journal about other first chakra concerns. Use the following prompts to help: Do you feel supported? Are your roots strong enough to support you wherever you are? How resourceful are you? Do you find yourself in situations that others want for you but don’t feel good to you? 18. For five minutes take long, slow, deep breathes, breathing into your tailbone area. 20. Pay attention to your ‘glass half-empty’ moments and work to change them to ‘glass half-full’ moments. Remember that abundance thinking attracts abundance to you – this includes abundant belonging. 21. Add healing foods to your diet, specifically those that support your root chakra. These include eggs, tofu, soy, beans, root vegetables, rainbow chard, beets. 22. Listen to a chakra cleansing and balancing meditation and set the intention for extra root chakra healing before hand. A strong root chakra is the foundation for health and the stability of your other chakras. By practicing these healing exercises you’ll gain a sense that you truly belong in the universe. Your energy and confidence will increase. Fear will no longer be a motivating factor in your life and you’ll live with the knowing that everything will turn out okay and according to plan. Listen to the Chakra Balancing and Restoring Your Energy Body Angel Meditation.